I exhibited the following 5 Bherwerre panels in the Sandholme Salon Show for SeeChange 18. The 3rd Stage of the Bherwerre Mural Project received funding from the Shoalhaven Arts Board while the entire project would not be possible without my project partners BBCR Shed who installed the panels at Sandholme. In the SeeChange Festival 2018 I have an installation in the Sandholme Salon Show 2 Jervis Street Huskisson Open daily – 10am to 4 pm 26 May 2018 to 11 June 2018. The installation is part of a larger ongoing project produced by Jenny Robertson titled ‘Shared Pathways – The Wool Road Project’ assisted by a grant from the Shoalhaven Arts Board. This video organised by Jenny and recorded by Michael Buckley and Susan McCauley will be on display as well as relics from the original Vincentia Post Office, an oral history recording of my mum Maree and uncle David (equipment and editing generously provided by Brad Slaughter BBCR Shed), Photographs of my grandparents Keith and Gloria Sheehy at the Holden Street General Store early 1960s and mum and David at the original building 2018. ‘Shadow Self (Winter Currawong and Ringtail Possum)’ 2016-17. Currawong, ringtail possum, bitumen, oil, aquarelle and rabbit skin glue on canvas. 66 x 165 (h) cm. ‘Death Hatch (Spring Port Jackson Shark)’ 2017. 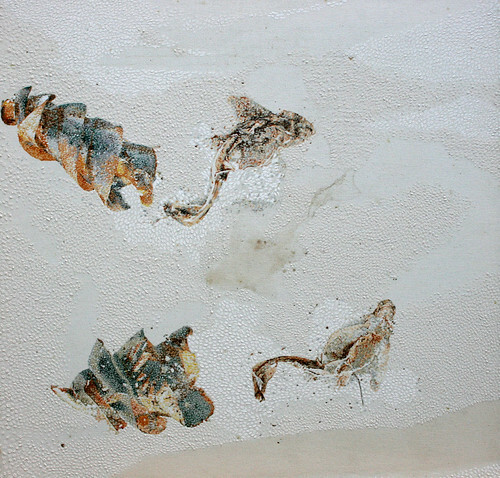 Port Jackson shark, bitumen, oil, delek and rabbit skin glue on canvas. ‘Body Map (Spring Stingray)’ 2017. Stingray, bitumen, oil, delek and rabbit skin glue on canvas. 88 x 73 (h) cm. I have been invited to exhibit in this group exhibition at the ANU School of Art and Design Gallery June 16th – July 15th. I decided to submit the Marine Relics shroud installation. Summer Woodducks 2015 Hill End Winter 2016 is a work I completed during a Hill End residency in 2016. Using techniques I developed during my PhD at the ANU 2009-2013, Woodducks continues my deconstruction of animal representation through site-based processes and integration of self with deceased animal ‘shrouds’. In Woollamia, I placed two deceased woodducks (gifted to me by Pirate) on canvas affixed to a sprung bed base and covered in mesh. I left the ducks to decompose for 4 months, photographed their decomposed bodies for later reference, collected the canvas and placed it in my matrilineal copper ‘cauldron’ in which I had steeped eucalyptus leaves. 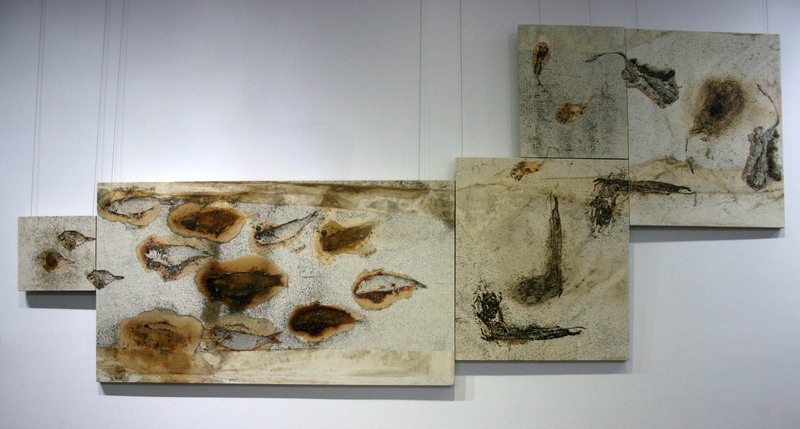 The canvas had collected evidence of the swamp site via mould on the surface and the prints of fallen leaves, while the mesh protecting the bodies from predators also left its rusty imprint. The combination of moist dank environment and exposure exceeding one month, resulted in the canvas beginning to also rot in contact with the bodies. After stretching the canvas, the woodduck shroud lived with me until my residency at Bundanon 2015, when I felt ready to begin integration with the spirit of animal and place captured in the work. I began by mending the holes in the surface using thread collected from the frayed edges of the stained canvas. I patched the larger holes using clean canvas to invoke renewal before sealing the surface with rabbit skin glue. I was drawn to the work again during my Hill End Residency in 2016. The cold winter in a 19th century home by the studio potbelly compelled a catharsis that found a path out through laboured painting of the woodduck shroud. Spring blossomed in red as emotions released and manifest. 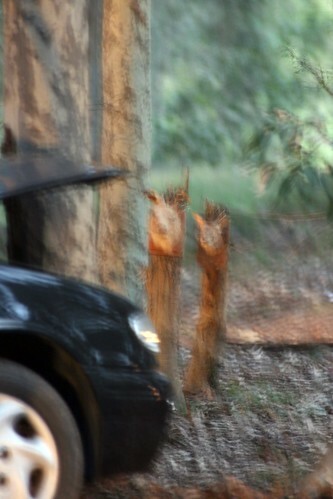 Images from the performance work at Bundanon Siteworks tonight! Night Visions is a collaborative performing arts project installed at Siteworks 2016 Bundanon. The brainchild of Alicia Talbot who invited a mixture of artists to contribute their response to a car crash. A team of local young adults are involved too as performers working with some very experienced theatre gems and sound engineer extraordinaires not to mention the deep cultural knowledge of the country offered by David Little, a talented local culture man who was in the year below me at Shoalhaven High and who has been generously sharing some of his ancestral knowledge with me. He took me to a Bora Ring and sung the country alive at day break. I played clapsticks along with his didge playing and singing in language. He includes both Dharawal and Dhurga to respect the intermarriage between both language groups during the contact period and beyond. The images show team Night Visions, the Bundanon landscape and the discovery of the kangaroo shroud I installed last year during my residency that has nicely cured. His bones are also evident.